360 SDM manufactures using cutting-edge, bio-compatible materials, which are perfect for temporary / long-term temporaries. 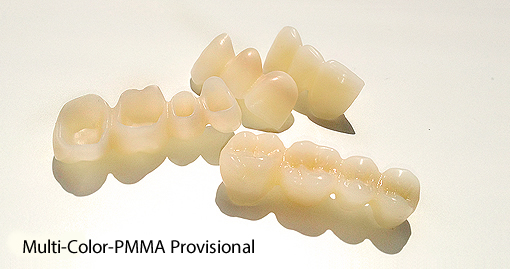 From tooth-colored PMMA we provide you with crown and bridge restorations with a clean edge, adjusted in the final stages for excellent esthetic quality. Color variations are available to our clients B1, A1, A2, A3 or as a multicolor PMMA in 3-layer technology, A1 – A3 and A1 – A 3.5 are available. 360SDM Dental Milling Center is a dental milling center for dental laboratories (USA), offering unrivaled milling quality for its customers at a fair price-performance ratio: zircon milling center, CAD/CAM dental milling, milling center e.max®, dental scanner, CAD/CAM abutment tooth colored PMMA, IPS e.max® CAD, 7Series scanner, 3Series scanner, dental CAD software, Dental Wings Scanner, Dental Wings Software, DWOS.